My strenuous work schedule made me so tired that I felt like taking a break. 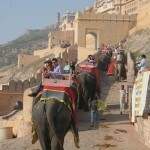 To regain my energy, I thought of visiting Jaipur in Rajasthan. As history always interests me, what could be the better option than that of Jaipur. Renowned as the ‘Pink City’, this royal city has always captured my attention. The day when I embarked on Jaipur tour with my sister Ekta and a friend, Deepti was like a new day for me. We all three managed to take 3 days leave from our offices and got ready for a change. We took a bus from Delhi and reached there within six hours. The moment I entered the glorious city of Jaipur, my joy knew no bounds. 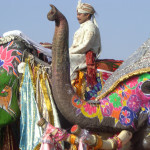 The city is renowned for its Rajput heritage and culture. Jaipur has numerous palaces that are renowned across the world for their architectural grandeur. The architecture beauty of these palaces showcases the perfect amalgamation of Rajputana and Mughal style. We stayed in a good hotel, which was equipped with all the modern amenities. To see the buildings painted in pink color is an amazing experience in itself. 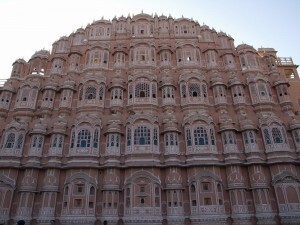 Our exploration of the city started with a visit to Hawa Mahal (Palace of Winds). Built in the year 1799 by Maharaja Sawai Pratap Singh, it is the most striking palace of the city. Its five-stories, hanging cornices, arched roofs, 953 tiny windows and pyramid-shaped structure make it a worth-visiting site. The City Palace is among the most predominant landmarks of Jaipur. I won’t be wrong if I call it as a perfect illustration of architecture. The palace also exhibits museum which has a rich collection of royal costumes and Rajput weapons. Though we felt tired walking in the huge palace, yet the charm to see the other parts of the palace did not allow us to stop and we moved on. We explored the beautiful Art Gallery, Mukut Mahal, Chhavi Niwas and Shri Govind Dev Temple of the palace. The old Amer fort was our next destination. It was truly a delight to watch the fort. We got to see a big wall of ancient times and the stunning Sheesh Mahal (the hall of mirrors), Sukh Niwas and Ganesh Pole. Ekta insisted us to go for an elephant ride. Taking a ride while sitting on elephant’s back was just wonderful and a great experience. Another fort which we visited was, Nahargarh Fort. 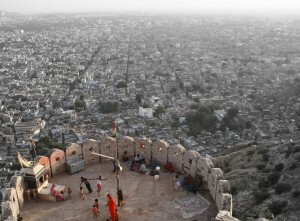 Perched high on the Aravali hills, the fort overlooks the city. It offers charming views that can be best seen at the time of sunset. Being a shopping freak, I could not help myself from shopping in Jaipur. Based on our experience, I can say that one must visit the lively bazaars of Jaipur. You can find here popular shopping items like brass ware, textiles, kundan, quilts and much more. I bought some jewellery and textiles. At last, we decided to visit Samode as we had some time in our hand. 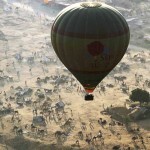 Located at a distance of 42 km from Jaipur, it is a great place to see. 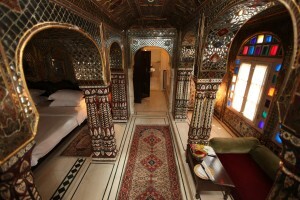 During this, the famous Samode Palace became the part of our exploration. Our tour was over and I was ready to get back to my hectic work routine but this time there was a big smile on my face.